The Jewish holiday of Passover begins at sundown on Friday, March 30th, and ends on Saturday, April 7th (although it lasts for only 7 days if you happen to follow the customs practiced in the Israel). 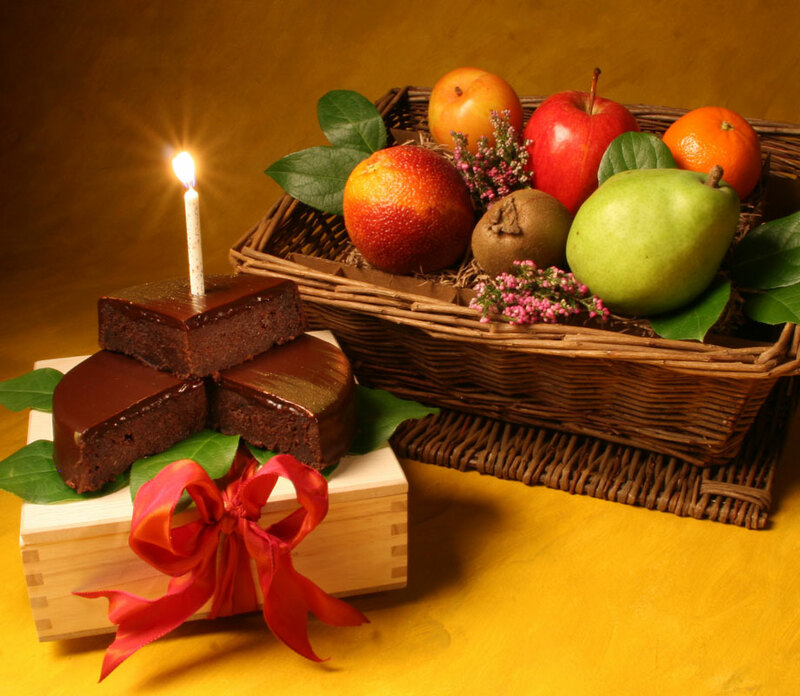 It is one of the most widely observed holidays among Jewish people. Passover is a celebration of the liberation of the Jews from Egypt during the ancient Egyptian empire. Almost everyone, no matter what their religious or cultural background, is familiar with the story of Exodus. In brief, it recounts how God sent plague after plague upon the Egyptian people until the ruling Pharoah at the time (unclear who this would be) finally allowed the Jews who had been held in slavery to be freed. Before the Pharoah relented, the Egyptians endured invasions, infestations, infiltrations, outbreaks, scourges, blights, afflictions and diseases! Specifically: Blood (all the waters turned to blood), Frogs, Bugs (probably lice), Wild Animals, Plague (killing livestock), Boils, Hail, Locusts, and Darkness. It wasn’t until after the 10th and final plague, the death of the 1st born child from every family (including the Pharaoh’s son), that the Pharaoh called for Moses and told him that he could set his people free. The holiday is called Passover (Pesach in Hebrew) because God “passed over” all the houses of the Jews and spared them from the final plague. The Seder (the ritualized dinner ceremony) is held on the first night of Passover. Some families and cultures may also have a Seder on the second night, but the first Seder is the main celebration. There is a very prescribed order to the Seder meal. It begins with saying the Kiddush (blessings) and drinking the first glass of wine. The Haggadah is the text that is read throughout the Seder meal which includes the story of the exodus and the Four Questions about how this night is different from all the others. At various points in the telling of the story, wine is drunk and specific foods are eaten to punctuate certain events such as bitter herbs to remind one of the bitterness of enslavement. 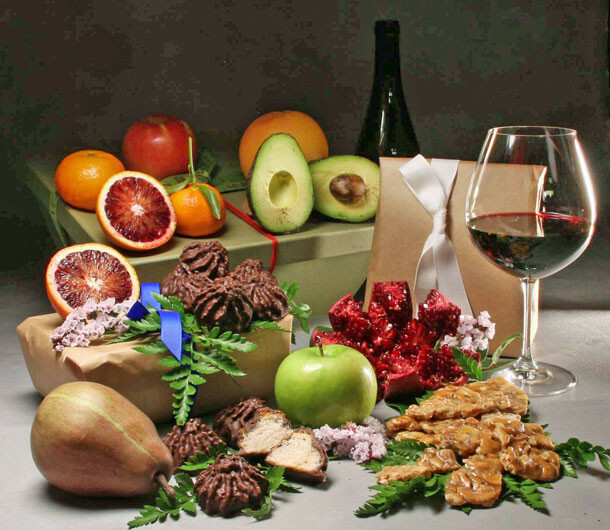 Any celebration that involves food and wine is a perfect gifting opportunity! 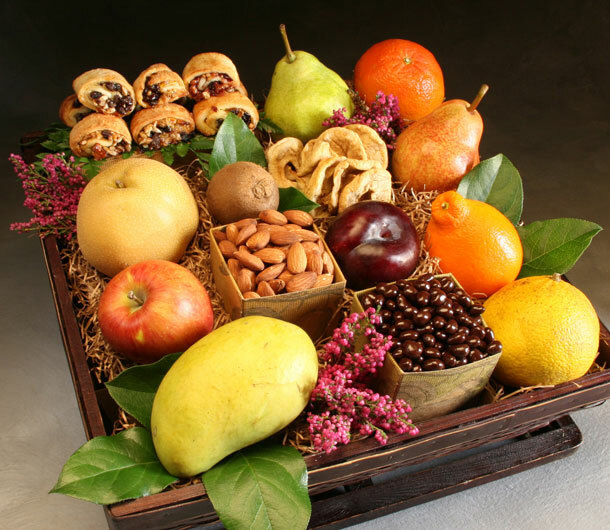 Every year we create several new Passover gift basket ideas just for this purpose. It should be noted that Passover gift ideas can be a little tricky since there are fairly strict constraints on what can and what cannot be eaten. For example, no leavened bread is eaten during this holiday. (This is because the Jewish people had to flee Egypt so quickly after they were freed that they didn’t have time to leaven their breads. Hence, the tradition of eating matzah and why Passover is also called the “Feast of the Unleavened Bread”.) Moreover, the food eaten at a Seder and indeed during the entire Passover holiday needs to be certified “Kosher for Passover” which means that the foods not only comply with Kosher dietary laws but also will not contain any grains that could ferment and possibly leaven, such as wheat, barley, oats, rye and spelt. Pre-packaged foods will have this label clearly marked. This Passover, we are offering three sizes of our gift baskets filled with naturally Kosher fresh fruit and two deliciously delectable Passover dessert items: chocolate dipped macaroons by the well respected Schick’s Bakery and Barton’s cashew crunch bars, both labeled Kosher for Passover. 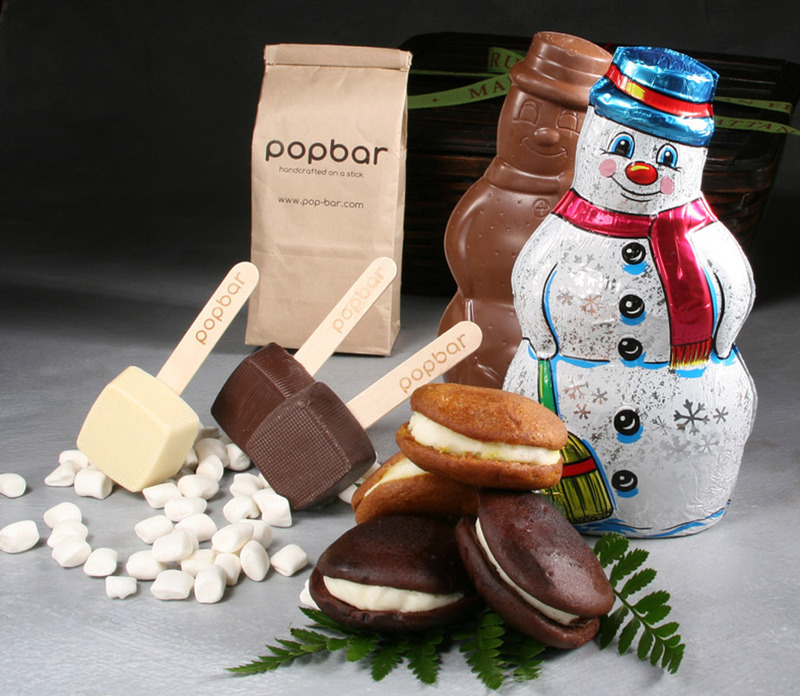 In all of our Kosher for Passover gift baskets we make sure to keep our Passover desserts and goodies in their original wrappings so that your recipient will know that your gift is definitely Kosher for Passover. 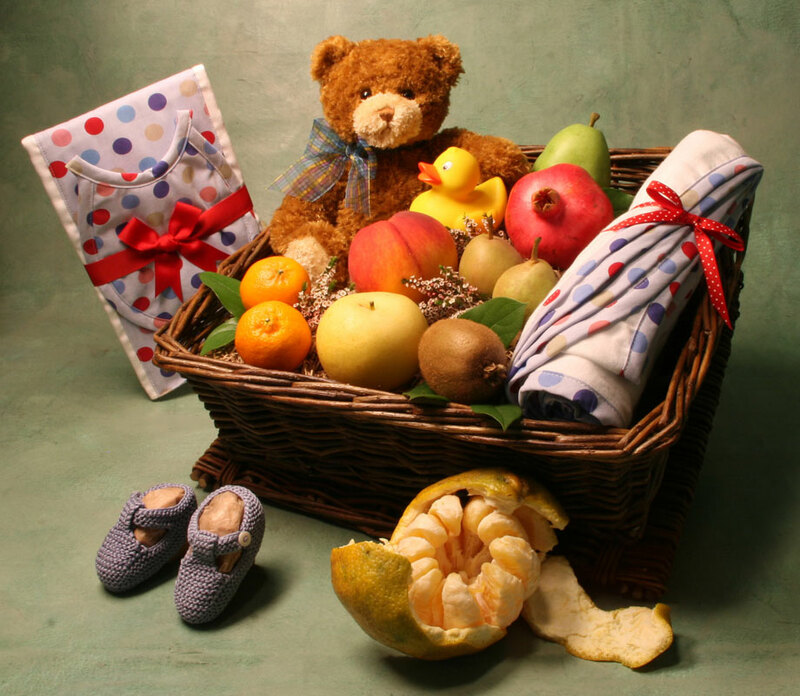 This medium sized Passover Gift Basket makes a perfect gift idea for Passover. Wine is a great gift idea for any occasion, but it’s especially appropriate as a Passover gift idea because one cup of wine must be drunk at four different points during the Seder (that’s a total of four glasses of wine per adult!). The four glasses symbolize the four promises God made to the Hebrews, loosely interpreted as: I will free you from your burdens, I will bring you out of enslavement, I will give you help and guidance, and I will take you as my people. So if the Seder will be hosting a large group (which is very common) there will definitely be a need for more wine. Make sure the wine is Kosher for Passover and remember that red wine is preferred. 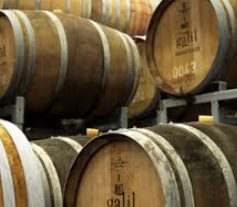 We are recommending a lovely dry red wine from the Galil Mountain Winery in the Upper Galilee region of Israel. This wine includes several grape varietals: cabernet sauvignon, cabernet franc and a little bit of petit verdot. Kosher for Passover red wine from Israel will be a welcome gift at any Seder dinner table. Include a bottle or two of this Kosher for Passover wine in one of our Passover dessert gift baskets for an extra special Passover gift idea. Your grand gesture will be greatly appreciated! Raise the bar on your Passover gift basket by including a Kosher for Passover wine. Whether you are attending the Seder, or sending your gift to loved ones from afar, your thoughtfulness will mean so much on this significant Jewish holiday. “Chag Pesach Sameach” or “Happy Passover” from all of us at Manhattan Fruitier! Last month we looked at three iconic drinks that best represent each of New York City’s five boroughs. Now it’s time to dive into Manhattan and find out what drinks best exemplify a few select neighborhoods. Grab a glass (have your Lyft app loaded) and let’s explore what each neighborhood has to offer. The Upper East Side is the embodiment of haute Manhattan culture. With lavish townhouses and mansions overlooking Central Park, this is the epitome of luxury. Whether its window shopping down Madison Avenue or spending a day strolling museum mile, the USE has something for native New Yorkers and visitors from around the world! 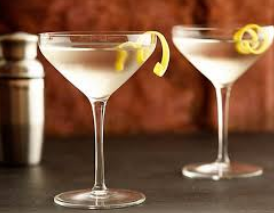 Classic Dry Martini: Whether you like it shaken or stirred, a Classic Dry Martini is the perfect embodiment of the lavish lifestyle of the Upper East Side. From movies to literature, this cocktail has become synonymous with swanky dinner parties and elegant bars. If you’ve never ordered a martini at a bar before, we recommend you try a gin martini and just tell the bartender you want a dry martini straight up with olives! That should do the job. Moet & Chandon Imperial Champagne: Moet is by far one of the most recognized luxury champagne brands around; and for a good reason! Founded in 1743 Moet & Chandon has become a staple drink in high society. From exhibition openings at the Guggenheim to exclusive penthouse parties, Moet & Chandon Imperial Champagne is elegant enough to launch any party the UES can throw! The earthier, more ethnically diverse and artsy sister to UES, the Upper West Side is home to such cultural venues as Lincoln Center (ballet, opera, classical music and jazz, theatre), Beacon Theatre, and Symphony Space. People come to the UWS to be entertained. During the day you can see families strolling about or grabbing a bite at the UWS’ famous Jewish eateries, Zabar’s or Barney Greengrass. This area is the perfect mix of boogie and family life. 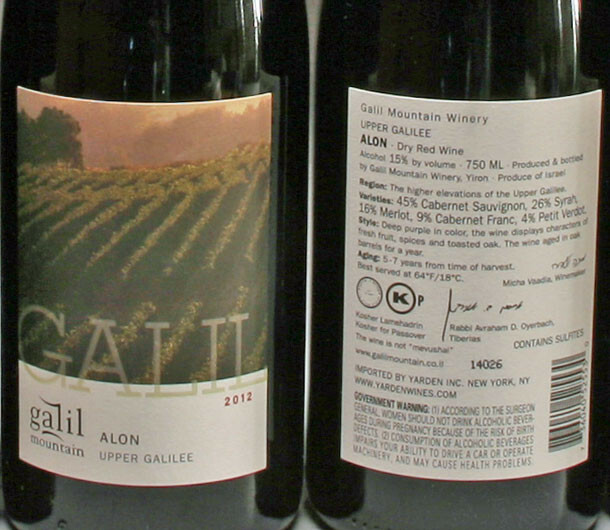 Galil Mountain Alon Red Kosher 2011: With the UWS being home to a large Jewish community, what better way to celebrate their rich heritage than a glass of kosher red or white wine from Galil Mountain Winery, using grapes grown in Galil Mountain range in Israel. We sell bottles of Sauvignon Blanc and Cabernet Sauvignon that can be delivered anywhere in New York City or New York State. Tom Collins: First made famous in London in the 1800’s, the Tom Collins became a classic cocktail for a night out. Made with gin and lemon, this refreshing cocktail is well suited for a night of opera or ballet. Stir lemon juice, gin and simple syrup in a highball glass. Garnish with lemon and a cherry. Known for its hip industrial vibe, Soho and Tribeca have something for everyone: great shopping, diverse food, music … it’s the place to be. 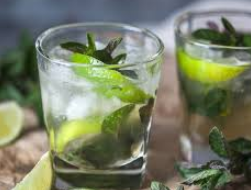 Mojito: One of the most versatile cocktails around, with so many flavor options it’s the perfect drink for a night out on the town! Why not add passion fruit or coconut for an exotic twist to the night out! In a shaker, lightly muddle the mint with wooden spoon. Add the simple syrup, lime juice, and rum, and fill with ice. “Launch Over It” IPA: This boutique brew is made by Birreria in Manhattan. It is cask-conditioned in bourbon barrels, and has notes of bourbon, citrus, and tropical fruit. It pairs well with a variety of foods, or perfect for drinking on its own. With billions traded each day, Wall Street is very much the financial capital of NYC and the world. With the extreme volatility of the stock market, you need a drink that can handle even the bear market. 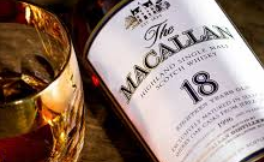 Macallan 18 year Single Malt Scotch: Some of us conjure up an image of leather-backed chairs, cigar in one hand and a glass of scotch in the other when we think of Wall Street. It may be a cliché today, but that doesn’t mean Scotch isn’t a go to drink for traders and bankers. That’s why we’ve decided on a Macallan 18-year-old single malt Scotch, aged in a mix of sherry and bourbon casks. It’s a rich and complex scotch, not for the faint-hearted. Whether it is in the boardroom or sipping at home, one thing is for sure, this scotch will make a statement. Habit Red Bordeaux: The investors and bankers of wall-street are famous for their extravagant dining habits, from business lunches to wining and dining clients. The one thing a meal always needs is a powerful wine that makes a statement. Habit Red Bordeaux is an esteemed bottle of organic red wine from Santa Barbara, CA. It’s full-bodied with notes of blackberry, dark cherry, chocolate, and earthy undertones that are sure to impress! Since prohibition, Harlem has been a cultural center of Manhattan, from jazz to soul food to gospel churches, this neighborhood has something for everyone. Walk along 125th Street starting at the historic Apollo Theatre and explore the rich culture and history Harlem has to offer. Harlem Cocktail: While it bears the name of such an iconic neighborhood, much like the Manhattan cocktail, little is known about its origins. Its roots can be traced back to the prohibition era. 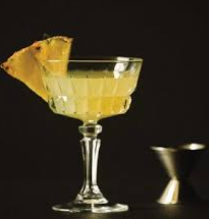 The unique combination of pineapple juice and gin makes for a delicious cocktail. Combine all, shake with ice and pour into a chilled cocktail glass. Gin Ricky: The Harlem Renaissance of the 1920s brought in a new age of music and a new popular drink. Singers such as Bessie Smith and Billie Holiday popularized blues and jazz vocals, during this period. To honor the deep jazz roots of Harlem, no drink is more synonymous than the Gin Ricky. It was said to be the preferred drink of F. Scott Fitzgerald. Fill a highball glass with ice and add the gin. Juice the lime halves into the glass and drop in the juiced lime shells. This ends of our Manhattan neighborhood alcohol beverage tour. More neighborhoods in other boroughs are just around the corner. Until then, visit the Manhattan Fruitier website to learn more about the wines featured in this blog post, as well as other natural wines. Manhattan Fruitier delivers wine and Champagne in New York. It’s that time of year again when the lights are strung across the office cubicles and Christmas carols are the background music when customers call. Everyone is buzzing with excitement for the annual holiday party. After a year of hard work, there is no better way to show appreciation than by giving a gift during the holiday season. We understand how stressful it is trying to find great holiday gifts for employees so that is why we’ve created a simple Do’s and Don’ts guide for Christmas gift ideas for employees. 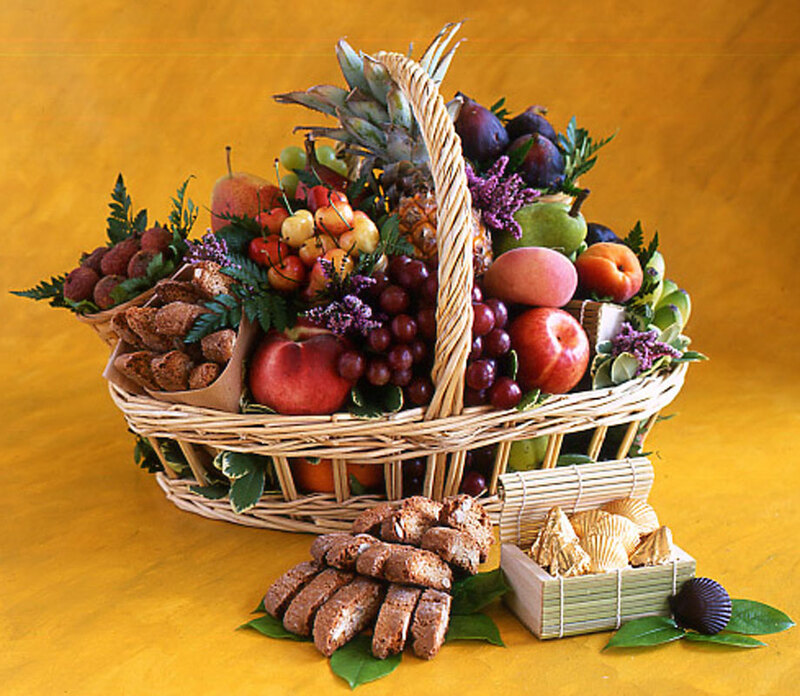 Giving a gift of a gourmet food basket is always appropriate no matter what the occasion! But when it’s the holiday time, you’ll want to look for something that really captures the spirit of the season. At Manhattan Fruitier, we have designed several new gifts with the 2017 holidays in mind. 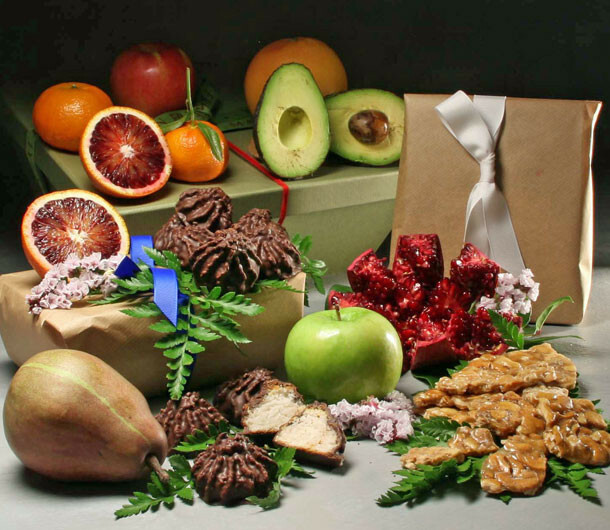 A lovely holiday gift to your employees would be our “Buone Feste da Milano”, pictured below. The focus of this gift is a panettone — a traditional holiday cake in Italy. Our panettone is a moist, rich cake filled with whole Amarena cherries made fresh by Cova Pasticceria, a Milan bakery founded in 1817. We pair this gift with six pieces of seasonal fruit for color and health. Another great holiday gift idea for employees is cookies! Cookie baking this time of year is a time-honored custom in many kitchens across many cultures. Our set of 31 delicate tea cookies evoke that handmade feeling. With eight different varieties of cookies, it’s like a little tasting menu in a red and silver festive box! 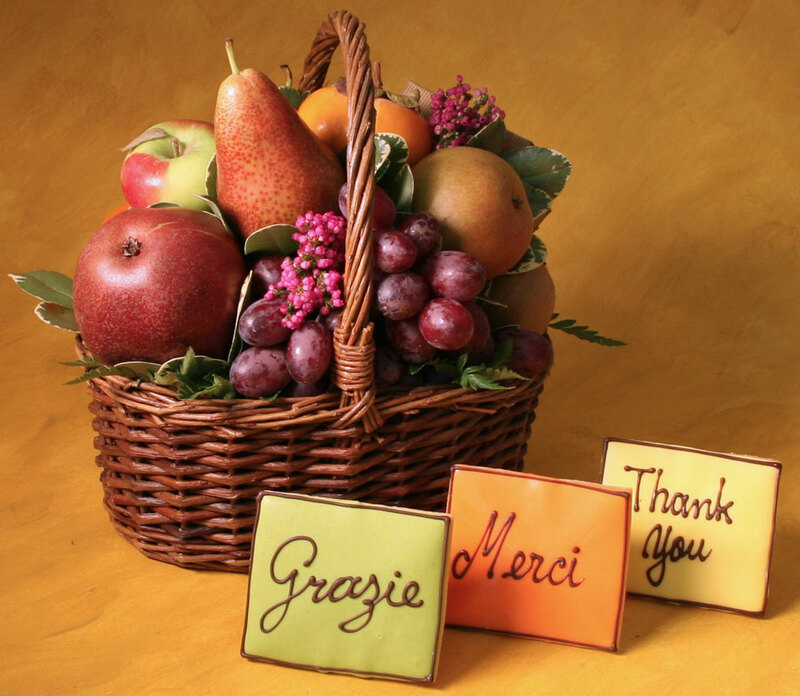 We also offer a set of three handmade cookies with the words “Thank You”, “Grazie” and “Merci” hand-piped on the top. It’s a nice and simple way to express your gratitude to your employees, after a year of dedicated work for your company. In the month of December, we top our gifts with a sprig of evergreen — specifically juniper, noble fir and incense cedar — which make each and every gift look like a celebration of the holiday season! Alcohol is great Christmas gift idea for employees who like wine and spirits. It’s something special and different to accompany a holiday cocktail party or Christmas dinner. However, it behoves you to know whether your employees drink alcohol. If they don’t, then a gift of wine or spirits, no matter how expensive, will be inappropriate and make your employee feel less than acknowledged. This defeats the whole point of the holiday gift in the first place! Similarly, you want to be careful when considering tickets to sporting events which are a popular gift to give to employees at the holiday time. While many employees might love to see their team play live, others may not follow sports and therefore have little interest. We recommend that if you want to give alcohol or tickets, be sure to choose for individual employees based on their preferences. While employers may think of a monetary gift as a “cop-out” due to it being impersonal in nature, we have found that it is often what employees want most. Research shows that many employees say that cash in the form of raise or a bonus is one of the best gifts their employer can give them. It is a very tangible way to recognize their work throughout the year. A gift of cash can be one of the best Christmas gift ideas for your employees because it gives them the freedom to purchase something they definitely want. Aanother thoughtful holiday gift idea for employees is paid time off. Some companies close up shop for the week between Christmas and New Years and this is greatly appreciated by employees who don’t have to use up their vacation time. You might also consider a few extra paid days off during the year that your employees can use at their discretion. Time is as precious and appreciated as cash in hand! The first thing to avoid when giving gifts this holiday season is items that can’t be consumed or otherwise used. While an item might be beautiful, if it serves no purpose other than to be admired, it’ll often be placed in a closet or on a shelf and forgotten. These days when people are focused on winnowing their non-consumable or non-functional possessions to things that one “loves to look at” or that “brings one joy”, it doesn’t make sense to give a gift that is just going to add more stuff to your employees home. Don’t make the mistake of giving products with the company logo on them as a holiday gift for your employees. No matter how great the company, this often looks as though you’ve gone to the nearest supply closet and raided the items that would ordinarily be sent to customers! Who wants a gift that reminds them of work? It’s totally lame and last minute and that’s not going to make your staff feel appreciated. Take a little time and spend a little money to come up with a thoughtful Christmas gift idea for your employees. Gift cards can be hit or miss as holiday gifts to employees. The first thing you want to avoid is giving a gift that requires the giftee to spend money in order to receive the gift. That’s no gift at all! Moreover, a $50 gift card to a fancy restaurant won’t cover the cost of the entire meal. While you don’t need to calculate in the cost of extras such as alcohol, be sure the amount of your gift card will cover a main course and either appetizer or dessert, at a minimum. Speak to the maitre d’ before you purchase a gift certificate. Another thing to look at when considering a gift card is whether the employee will actually use it. Many of us have a drawer full of gift cards to places we never go to, or to companies we do not shop with. We recommend gift cards to major online distributors such as Amazon. This allows them to pick their own gift and has the best chance of being used and then remembered. We hope this go-to guide will help you decide on some great holiday gift ideas for employees. Remember, if it’s thoughtful, even a small gesture can mean so much for the people who support you all the year through. Don’t forget to show them how much you appreciate their hard work for you and your company. What are the Best Fall Fruits? Although the Autumnal Equinox is not until September 22nd, you can sense the coming of Fall much earlier. On the drive north to visit my Dad in Connecticut shortly after Labor Day, I saw the first indisputable signs of Fall — changing leaves on some trees along the highway! Shortly after that, Jehv and I took out our air conditioners and opened our windows to the cooler night air. The next morning, I awoke to the sounds of the birds chirping (which I hadn’t heard all summer with the air conditioners roaring). It would have been an entirely lovely experience to hear the little birdies if only I could have gotten back to sleep! Fall is truly upon us and while we may lament the loss of the long, lazy days of summer, Fall brings its own unique pleasures. For instance, what’s better than tasting an apple from the first crop of the season? We all look forward to the fruits that are harvested during the autumn months and here is what I think are some of the best Fall fruits! Apples of all varieties are ripening in the orchards right now and some will be ready to pick before others. October is the peak month. Drew says “Apples are ready for picking when it’s cold enough for your nose to run!” Love the visual, Drew…..
Why are apples the number one best fall fruits when we can eat them year round? Because of their freshness! After picking, apples are placed in cold storage to retain their flavor and can last a long time. That’s why we can offer apples in our gift baskets year round. But there is nothing like biting into a crisp, juicy apple at the peak of its freshness! At Manhattan Fruitier, we look forward to getting the first crop of freshly picked apples to put into our Fall gift baskets. We are always on the look-out for more unusual, antique apple varieties grown on smaller local farms. We also strive to select as many organic apple varieties as possible for our fruits for the Fall season. 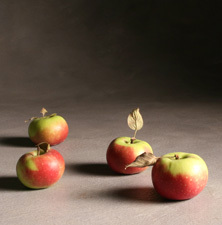 Below is an example of the kinds of apples we feature in our gifts for Fall. September: Jonagold and MacIntosh apples. October: Black Oxford, Blondees Champlain, Blue Pearmain, Esopus Spitzenbury, Hidden Rose, HoneyCrisp, Jazz, Mollies Delicious, Opal, Orlenas Reinette, Rambour Franc and Zester Champlain. What fruit better characterizes the Fall season then the pumpkin? Yes, pumpkins are technically fruit! (Fruits are the seed bearing part of the plant that grows from the ovaries of the flowering part. Vegetables are other parts of the plant: the stem, the leaf, the root and the bud). Pumpkins are one of the top fruits for Fall. We all associate the Fall with the pumpkin: in October, it’s the Halloween Jack-o-Lantern; in November it’s pumpkin pie at Thanksgiving dinner. Those of us who frequent Starbucks’ stores know that the limited edition “pumpkin spice lattes” launch in early September! Many of us probably recall the tradition of going to pumpkin farms on school trips in October or with your family as a kid. You could pick-your-own pumpkins, have some hot apple cider, and grab a hay-ride too! Maybe you are planning a visit to a local farm with your own kids this year. The height of pomegranate season is in the Fall and that makes them another distinctive fruit for Fall season. The first pomegranates are harvested in California in October. Pomegranate season lasts until January. 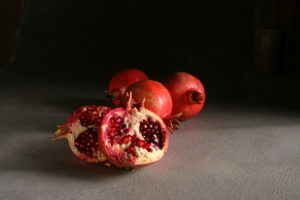 But we are able to offer pomegranates pretty much throughout the year for two reasons. First, as soon as you pick a pomegranate, the ripening process stops. If you can keep them in cold storage, pomegranates can retain their flavor for a long time, just like apples. Second, pomegranates are grown successfully around the world so that they can be available for import year round. For example, pomegranate season in the Southern Hemisphere is from March through May. Cranberries are one of the few fruits native to North America and have a long tradition in New England culture. Most cranberries (which grow on vines) are farmed in Massachusetts in water-logged bogs. Cranberries are truly a Fall season fruit. The cranberry harvest is relatively short beginning in mid-September and ending sometime in early November before the frosts. Cranberries have an especially strong connection to the Thanksgiving holiday: cranberry relishes are ubiquitous at the Thanksgiving table and probably have been since the time of the first settlers. Grapes are readily available at the supermarket year round, but in the United States, the grape harvest begins in mid-summer in California and continues well into September. At Manhattan Fruitier, we especially look forward to muscat grapes. Muscat grapes are a bit more unusual than the familiar seedless red and green Thompson grapes, although we love them too! 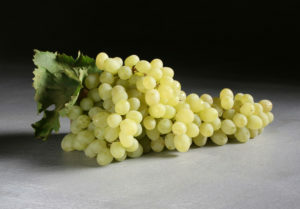 Muscat grapes have a distinctive perfume-y taste. They look different too, tending to be larger than most grape varieties with slightly thicker skins which some people like to peel, a few big seeds, and a color that is a combination of green and red looking rather as if it is blushing! We think Muscat grapes are one of the best Fall fruits to look forward to. 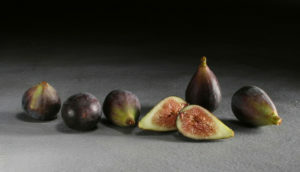 Generally, fresh figs have two crops. The first crop is picked sometime from May to July depending on the variety, and then again from September to November. 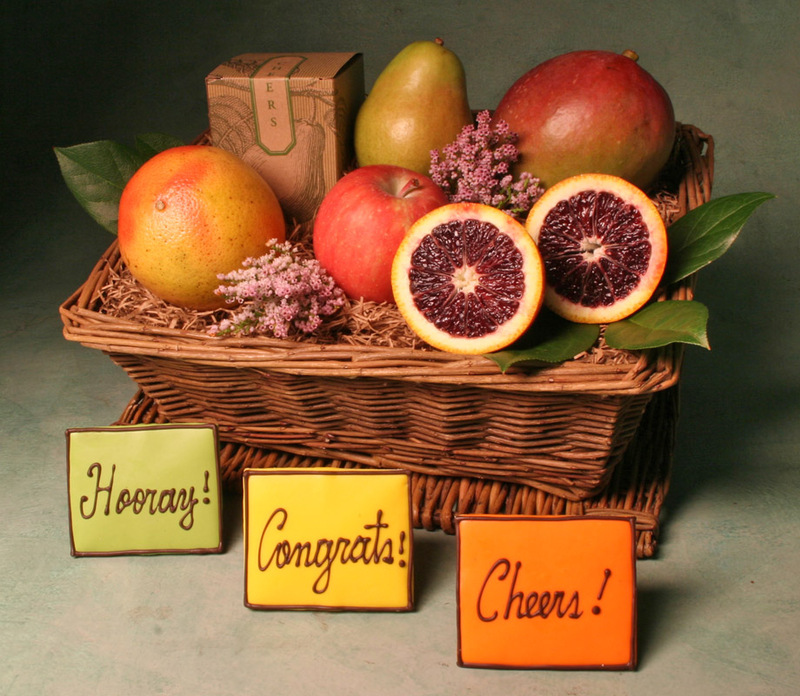 At Manhattan Fruitier, we pair our Prosciutto and Parmigiano gift basket with fresh figs whenever they are in season. Prosciutto and figs are a classic Italian combination, and nothing beats the synergy of those flavors. We get our fresh figs from California and typically use the rich and deep purple Black Mission figs. Sometimes we use the lighter tawny colored Kadota figs or the dark Brown Turkey figs. If you’ve tasted a fresh, ripe fig, you’ll understand why we have highlighted them as one of the most eagerly anticipated fruits for Fall. And if you’ve never tasted a fresh fig, get to your local market — you are missing out on a real treat! Want some inspiration for fall-themed gifts? Check out our 5 Fall Gift Basket Ideas post. More Reasons to Send a Gift AND Tips on What to Say! If you think about it for a few seconds, you could probably come up with a handful of occasions appropriate to send a gift. While giving a gift can be a perfunctory gesture, usually a gift is sent to convey a particular feeling that shows you care. As part of getting to know our customers better, we decided to take a closer look at the reasons why people send Manhattan Fruitier gifts, and give you some guidelines on how to write the perfect gift card message. Sympathy — a tasteful alternative to flowers, particularly in the case of Jewish condolences. In the case of condolences, sometimes the simplest card message is the best. Get Well — whether sent to hospital, rehab or home. For people who are seriously ill and/or not expected to recover, it is obviously inappropriate to say “Get Well Soon”. Something along the lines of “Thinking of You” or “I hope you are having a good day” would be more suitable. Congratulations — on your new job, graduation, promotion, engagement, marriage, commitment ceremony, marathon, etc. Make sure your message communicates genuine happiness for the person without a hint of jealousy over their good fortune. New Baby — and this includes gifts for the baby as well as gifts for the new parent(s). You can write this note card either to the new baby directly or to the new parent(s). Anniversary — another way to say “I love you!” The most memorable cards are the most personal. Whenever possible, use your own words to speak to your gift recipient and say what you really mean. 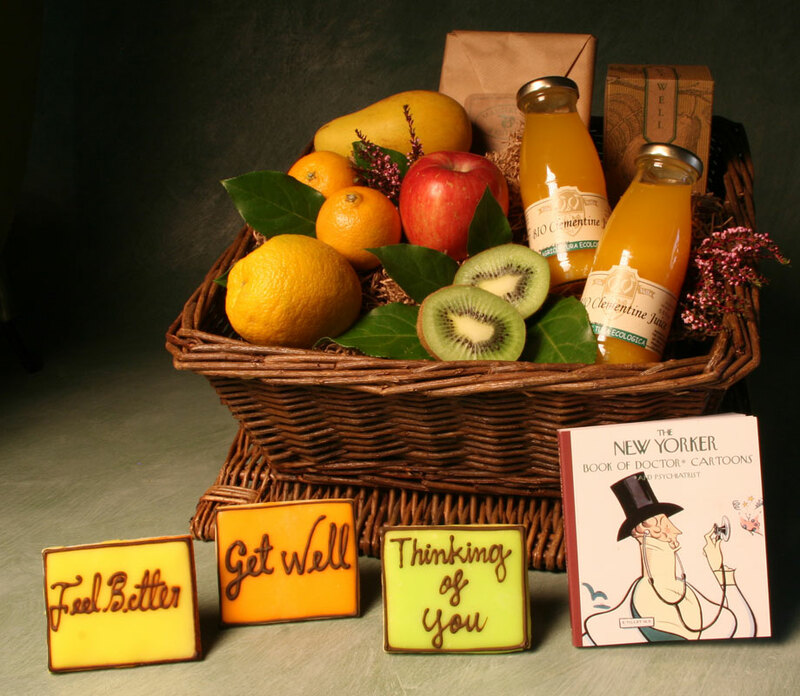 While not as popular as the above reasons, here are a few other reasons Manhattan Fruitier customers love to send gifts. Apologies, welcoming neighbors, hostess gifts, care packages to colleges, etc. Apology gifts are sent more often than the other “others”. An apology note MUST be sincere. And don’t ever say “I’m sorry, but….”! So these are the reasons our customers send Manhattan Fruitier gifts. 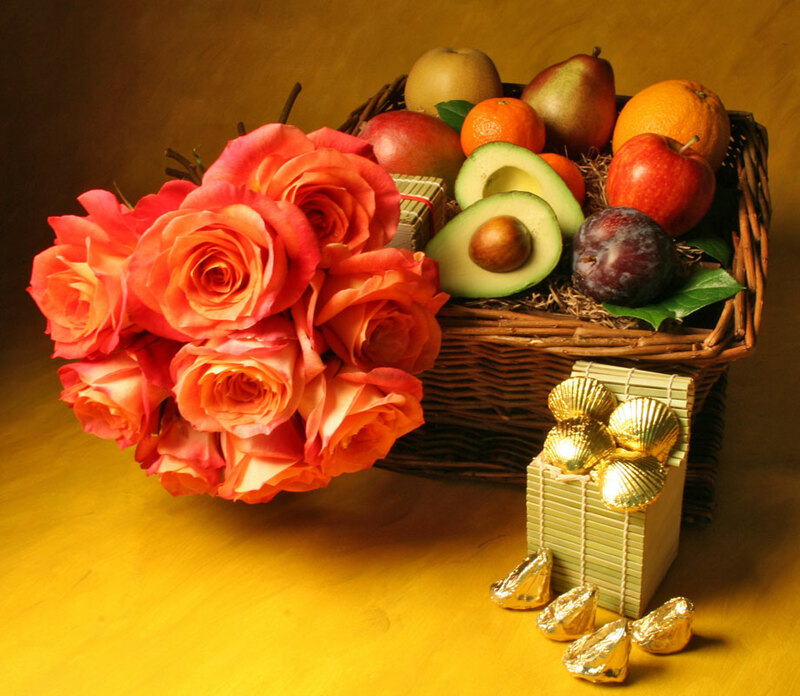 For more detailed suggestions about what to say for each specific gifting occasion, visit: http://www.manhattanfruitier.com/gift-message-ideas.